Using three-dimensional infrared (3D-IR) spectroscopy, we investigate the vibrational dynamics of isotope-diluted ice Ih. By probing the OD stretch mode of HOD in H2O, we observe an extremely rapid decay (≈200 fs) of the population from the second vibrational excited state. 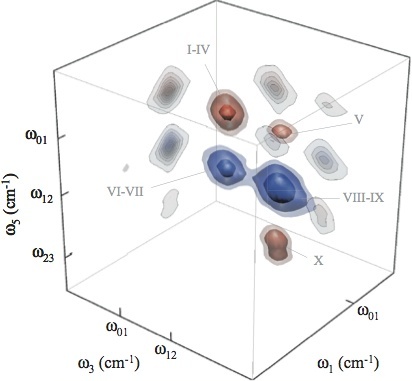 Quantum simulations based on a two-dimensional Lippincott-Schroeder potential agree nearly quantitatively with the experimental 3D-IR lineshapes and dynamics. The model suggests that energy dissipation is enhanced due to nonadiabatic effects between vibrational states, which arise from strong mode-mixing between the OD stretch mode with lattice degrees of freedom. Furthermore, we compare the simulation results to ab initio based potentials, in which the hydrogen bond anharmonicity is too small to reproduce the experimental 3D-IR spectra. We thus conclude that the Lippincott-Schroeder potential effectively coalesces many degrees of freedom of the crystal into one intermolecular coordinate. Publication: Perakis, F., Borek, J., and Hamm, P. (2013) Three-dimensional infrared spectroscopy of isotope-diluted ice Ih. J Chem Phys 139, 014501 (DOI: 10.1063/1.4812216). Figure: 3D-IR absorptive spectrum of the prototype sample CO2 in H2O with the spectral positions of all the indicated diagrammatic contributions.